Adventures in Unfortunate Graphic Design | The Vermont Political Observer. Generally speaking, Sue Minter’s gubernatorial effort has taken on a sharper edge since Molly Ritner came on board as campaign manager. They’re quick on the draw with statements on the issues, they’ve got Minter out and about quite a bit. And they came up with a nice way to spotlight a liberal jobs agenda: the Making Vermont Work Tour. Arguably derivative of Pihl Scott’s Vermont Jobs Tour, but a good way to push back on Republican claims that Democrats are job-killers. I take one look at that, and I see the bus about to go off a cliff. This entry was posted in 2016 election, Sue Minter and tagged bad graphic design, Making Vermont Work Tour on May 4, 2016 by John S. Walters. Oops. And the cliff just happens to be in the NEK. Nicely done.
. . . or drive all the workers/jobs straight into “tax-free” New Hampshire! Ugh… Agree with you. Terrible logo. The whole tour idea is pretty terrible, if you ask me. If you don’t know enough about the workers in your state by now, why are you running for governor? Here’s an idea. Why not visit with the wealthiest Vermonters to see if they are willing to pay more taxes? Remember that letter about 100 of them wrote to Shumlin or Douglas a few years ago, telling him they will pay more. Talk with those Vermonters. Trouble Connecting with the Common Vermonters? 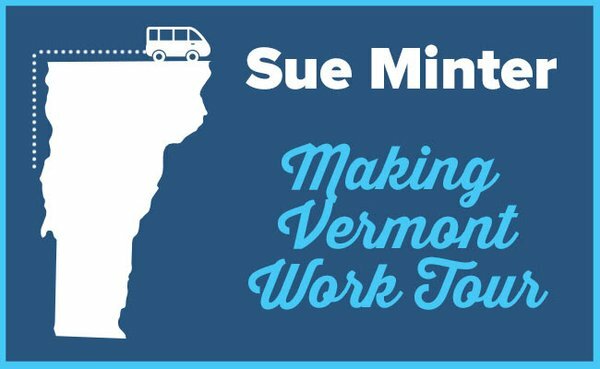 Independent of the “off the cliff” problem – the slogan “Making Vermont Work” sounds like Sue is looking to set up some labor camps or something. “Getting Vermont Working” or some other more helpful sounding slogan might be less problematic. I agree with Pete, all these wealthy folks (Dunne, Lisman, Galbraith and to a lesser degree Minter) sounding like they need to beat the bushes to find out what troubles Vermonters are experiencing seem like so much theater – for heaven’s sake pick up the newspaper for a couple of days and they’ll have a pretty good idea what’s ailing the state (and maybe spot a few hints on how to fix them). Believe me, NH is not tax free. The bummer of all this is that one reason for all these dire things that everyone talks about are the result of economic policies from the national level that have deliberately set out to screw the common person as much as possible. Nothing that any one of these candidates can do will really help that — no working tours, nothing. Lisman or Scott’s policies will just exacerbate the situation. Galbraith, though, is onto something when he talked about raising the minimum wage. And, of course, a much fairer tax situation, but I doubt that’s going to happen. Phil Scott should take some pride in the fact he’s the standard-bearer for gov race here while no-new-id-as Minter & Lisman deliver merely poll-driven responses of in-kind statements- brand X watered-down version with inartful bland generic packaging. Huge compliment to be copied by these two who pretty much say ‘I’ll have whatever he’s having, waiter’. Stealing Scotts’ job-roadshow, low-blow but such a huge laugh with childlike me-too written all over it, really doesn’t matter much — will be surprised if it’s not a flop — just ain’t got the same soul. things done”, as someone who includes leadership as strong point has thus far not demonstrated either unless in spotlightincluding failure to protect AOT workers who quit & forced to file lawsuits due to long-time harrassment-lgbt status makes it very serious imo. A leader is more than a montage of photo-ops, leads whether everyone is watching or not & not afraid to get hands dirty, protecting the vulnerable not considered optional. This is not how real & solid leaders behave. While Scott has been investing goodwill in VT and workers while burnishing record Ms. Minters’ resume has appearance of following the path of a career politician and now assembling the inauthentic ready-made gov-in-a-box kit- gifted courtesy of mentor Shumlin to conceal, carry on & protect legacy of failure.